Learn how to make homemade Italian pistachio gelato and transport yourself to the streets of Italy with each bite! 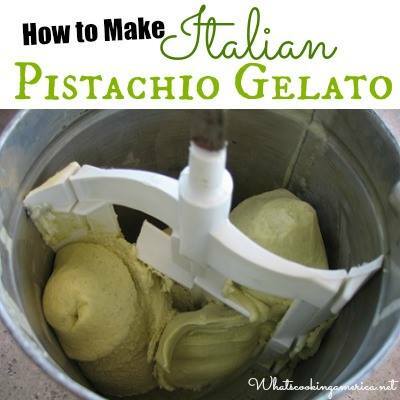 Italian Pistachio Gelato recipe and photos are being shared by my daughter, Nancy Hartman of Portland, Oregon. Check out Nancy’s article Italian Gelato – One Day I Walked Into A Gelateria. Nancy says, “I was having fond memories of Italy today and decided to try my hand at my favorite gelato – Pistachio Gelato! 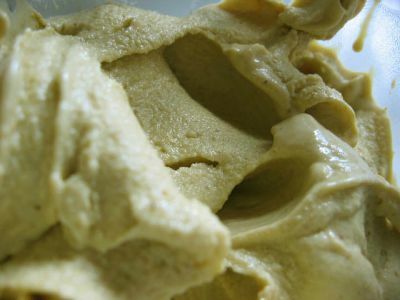 I searched the web for an authentic Italian Gelato recipe, and there are not a lot out there. I found one to try, I played around with, and it turned out great! When in Italy, I also learned that one of the main differences in gelato is in the preparation. Gelato is made in a custard form first, heating it up, and then allowing it to cool down so that the milk proteins bind. This produces the smaller ice crystals and delicate flavor that differentiates it from ice cream. Gelato is definitely one of Italy’s great culinary creations! More delicious Ice Cream, Sorbet, Granita, and Gelato Recipes. * Also know as corn flour. ** Regular granulated sugar may be substituted. NOTE: Vegan Version: Substitute almond milk for the whole milk. When in Italy, I learned that one of the main differences in gelato is in the preparation. Gelato is made in a custard form first, heating it up, and then allowing it to cool down before putting in the ice cream maker. In a medium-size saucepan over medium heat, combine the remaining 3 cups milk and the vanilla extract. Stirring occasionally, heat the mixture to almost a boil; stir in the cornstarch mixture and let simmer from 5 to 12 minutes to thicken, stirring constantly. 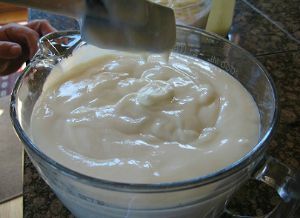 Another important tip is to stir slowly, (do not whisk) which will prevent too much air from being incorporated in the custard and will produces smaller ice crystals. Prepare the Pistachio Cream (see recipe below). Transfer the mixture into your ice cream maker and freeze according to the manufacturer's instructions. Either churn your ice cream by hand or by motor. With Gelato, it is best to not process it until it is hard. Instead, stop the ice cream maker at soft serve consistency, then put it in a container in your freezer until hard for a delicate flavor and texture that differentiates it from ice cream. Makes approximately 1 quart of pistacho gelato. Place the prepared pistachio nuts, sugar, and olive oil in a food processor. Blend/process, adding the hot water (1 tablespoon at a time to control the consistency of the cream) until pistachios are a smooth, creamy consistency that blends freely in the blender (I actually used 9 tablespoons of hot water). Stop the processor and scrape down the sides of the bowl several times during this process. 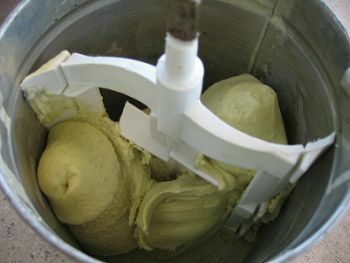 When done, cover and refrigerate the Pistachio Cream until ready to use in making the gelato.